Whenever we are feeling low, for whatever reason, it is very easy to find comfort in food. Chances are it will be some recipe from our childhood, something that brings back happy memories of opening the front door and being met with the lovely smell of cooking. Something, too, that belonged to a time when we were totally oblivious to what high calorie food might do to our waistlines. Whatever your comfort food favourite, whether it is savoury or sweet, hot or cold, chances are there is a low calorie version today which will allow you to indulge. Use any mixture of root vegetables for this dish according to preference. You may think that dumplings and low calories don’t go together, but this recipe does not use suet fat, only a little butter. Preheat the oven to Gas mark 3 (160 degrees Celsius). Trim away any fat and cut the steak into cubes. Quarter the onions and halve the mushrooms. Quarter the carrots and celery. Place meat and vegetables in a casserole, together with the herbs, bay leaf, sugar, stock and stout, if using. The stout gives the recipe a rich brown colour and added flavour. Stir to mix the ingredients thoroughly. Gently bring the stew to the boil, cover and put into the preheated oven. Cook gently for 3 hours until the meat is really tender. To thicken the gravy, combine the cornflour with 1 tbsp of water. Add it to the stew and bring to the boil, stirring until it has thickened. Season to taste. This dish is low calorie, 300 per serving. Complete the meal with low calorie dumplings, added to the casserole during the last 20 minutes or so of cooking. Combine flour, parsley, butter, baking powder and salt in a food processor, pulsing until the mixture is like breadcrumbs. Add the milk and process for a few seconds until the dough is stiff. Drop tablespoons of the dough into the hot casserole, cover and continue cooking for 20 minutes until ready. 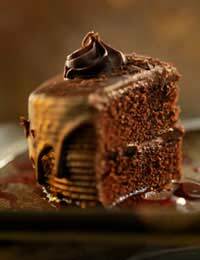 You get all the flavour of chocolate without the fat in this light cake which uses egg whites and cocoa. Use canned, stoned cherries, or a combination of soft fruits such as raspberries, strawberries or blueberries. The cake has 180 calories per serving. Preheat the oven to Gas mark 4 (180 degrees Celsius). Line the bottom of a 23cm round deep cake tin with greaseproof paper. Sift flour, cocoa powder, half the sugar and salt into a bowl. In another large, grease-free bowl, whisk the egg whites to soft peaks. At this stage, add the remaining sugar, 1 tbsp at a time, and the vanilla, while continuing to whisk. Continue until the egg whites are glossy and smooth and hold a firm peak. Sprinkle the flour and cocoa mixture over the egg whites and fold in gently but thoroughly, taking care not to knock all the air out. Spoon the mixture into the tin and smooth gently. Sprinkle the fruit on top. Bake for 20-25minutes until the cake has risen and just firm to the touch but still moist on top. A skewer should come out clean. Remove from the oven and leave to cool. Sprinkle the cake with icing sugar before serving, and serve with fromage frais if liked. If calorie laden roast potatoes are your comfort food, you have to be aware that this recipe is not whole potatoes roasted in fat. However, they do have a lovely roast flavour and a low calorie 124 per serving. Preheat the oven to Gas mark 3 (170 degrees Celsius). Toss the potatoes with the oil, garlic, rosemary, salt and pepper in a large baking dish. Bake for about an hour until the potatoes are tender when pierced with a fork. Serve immediately.